Is Black Friday Fashion really worth it? I was dubious as to whether Black Friday would be of any benefit to a client when doing a personal shopping session - I always associate Black Friday craziness with nutters fighting over flat screen TV's! So, did the pain of the crowds pay off and give us those bargains we were hoping for? My verdict is a resounding 'YES'!! If you love a deal, then you can definitely grab amazing discounts on clothes (and not just all the stuff they can't shift), but it's well worth planning so you know who's discounting and whether it's on selected items or not. For example, the effort in Zara just isn't worth it. 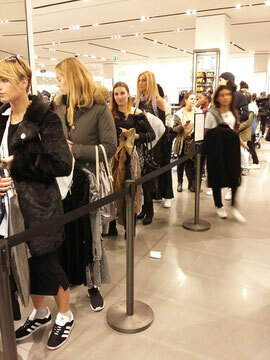 The store is rammed with frantic bargain hunters and the discounts were on selected items only. As everything is already keenly priced, the discount is minimal and you can guarantee the things you want, won't be included in the promotion! Black Friday fashion really pays when you treat yourself to a higher end retailer who keeps things simple and offers the promotion on 'EVERYTHING'. The best example yesterday was All Saints who had 30% off everything. If you have dreamed of one of their beautiful leather jackets then this is the day to buy it! It's a hell of a saving with full price jackets being around £320! 30% off everything in All Saints! 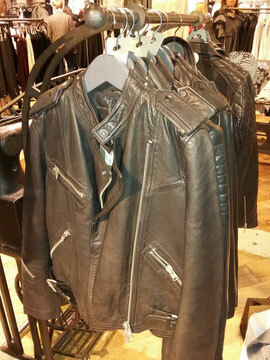 Even their continuation leather jackets! Other retailers embracing Black Friday discounting yesterday were Banana Republic, Warehouse, Topshop and Ted Baker. Definite bargains to be had! On the flip side and from a personal point of view, Black Friday doesn't sit that well with me. I'm of course not one to turn a discount down if it's offered, but there is something quite grotesque about the assault made on the High Street yesterday. I hugely admire the retailers who make the brave decision to opt out of participating. Those retailers such as Jigsaw and Fat Face were an absolute pleasure to shop in yesterday and I completely understand why such ethical brands choose to hold tight. Reading Peter Ruis's comments gives me warm feeling - so much warmer than a 25% discount on a jumper! Also reported in The Guardian, John Snare, founder of the brand 'Braintree' which was set up in Australia and is now based in London, said: “Black Friday doesn’t sit well with us as a business but it’s impossible to ignore. This is our way of participating without compromising our values and is a very good opportunity to support some important causes.” Braintree will be donating half of sales via its website on Black Friday to the refugee council and a second charity to be voted on by shoppers. Fat Face is again running it's alternative Black Friday campaign in which it donates 10% of net profits over the Black Friday weekend to charities local to its stores. Last year the company handed out just under £200,000. Tell me this doesn't make you feel warm and fuzzy!! 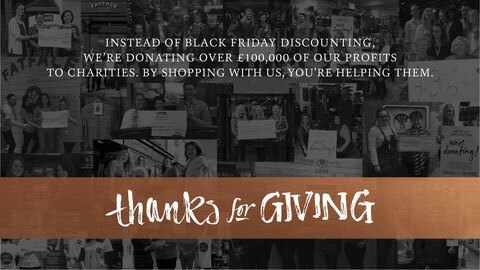 Fat Face donating profits to charity instead of discounting - amazing! So if bargain hunting for fashion is your thing, then it's definitely worth braving the crowds - just do your research first, plan your trip and identify the pieces you want to buy before you get there. Never buy something just because it's on promotion!! And don't dismiss shopping at the stores not involved - admire and support them too!